Apartment has tow bedroom ground floor apartment in the Riverside village of Ramla.2 Bedrooms 1 BathroomsBuilt in 2015, 95 sqm plot size garden, close to shops and restaurants, washing machine, nile view roof terrace is amazing, satellite TV 2 condition units, recently decorated. Beautiful villa three minutes walk from the Nile. Consisting of:Ground floor: two rooms, a bathroom and an open kitchen. The kitchen is fully equipped and all rooms are furnished.First floor: three rooms, a bathroom and an open kitchen.The first floor can be used as a separate apartment. A good piece of land available in el Gorf. In front of the river Nile on the West Bank, 810 m².92 $ per sqm. Please contact us for further information. Nice little villa in west bank, lovely location, 3 minutes walking from the Nile.1 bedroom, 1 Bathroom, Theban peak view, small garden. This big villa has four flats on three floors.In groundfloor this villa has two flats, one with 2 bedrooms and 2 bathrooms on 105 sqm and a second flat with 1 bedroom and 1 bathroom on 126 sqm.In first floor there is a flat on 105 sqm with 2 bedrooms and 2 bathrooms and a nice terrace.In the second floor on the roof there is a fourth flat with 1 bedroom and 1 bathroom and a terrace on 80 sqm. The apartment has two bedrooms and two bathrooms. It is beautifully fully furnished to a very high standard including sheets and towels. It has Sat-TV and air con. A patio door leading into a large garden.There is also a private promende to sit, relax and watch the amazing views and beautiful sunsets at the end of the day with tables and chairs. This modern furnished bright apartment on the second floor of a multi-party house is located in El Ramla. It offers 2 bedrooms, 2 bathrooms and is fully furnished, including a full kitchen, satellite TV and air conditioning. In addition, the apartment has a large private terrace.4 minutes walk from the ferry or the Nile. Land for sale in west bank in Luxor Egypt 17m x 90m = 1. Our best accomadation in decor and function , wether for living or entertaining your guest this villa has the most to offer ,fitted kichen fully furnished etc.From rooftop to relaxing in the garden area this rental is worth your attention.Three minute walking distance along the Nile to ferry for East Bank and Temple of Luxor. Valley of the Kings is 10 minutes distance by car. Designed and finished to a high standard spacious. 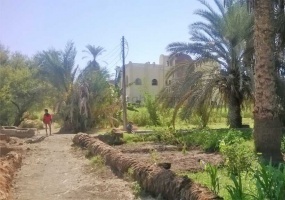 3 stores, 4 bedroom villa with large private garden, roof garden and terrace with shaded area.The owner has recently purchased an adjoining plot land at the front of the property measuring 17o sq meters, there is the potential to build a swimming pool in this area. A good piece of land available in front of the river Nile on the west bankApproximately 2000 sqm. This is a villa with 2 apartments which has recently been updated. Close to all local shops and restaurants.As you enter the gates there is a small front garden that serves the downstairs apartment leading into the kitchen. From the kitchen you walk into the living room where there are 2 double bedrooms both with air conditioning.